Minority equity stake in the company (typically up to 35%). Pre-agreed share buy-back terms with price typically based on a formula tied to the revenue performance of the company or other growth metric. Patient capital with a pre-agreed buy back that typically takes place in stages over years 3-5 (with full exit in year 5). Unlike traditional private equity, we do not force the sale of your company to a 3rd party. IS GAZELLE FINANCE A GOOD FIT FOR MY COMPANY? We provide tailored financial solutions for strong, fast- growing small and medium enterprises - companies that we call "gazelles" - that are in need of capital to further expand their businesses. Our financing and partnership - oriented approach enables entrepreneurs to take their businesses through the next stage of revenue growth and achieve their full potential. We provide growth financing. Proceeds may be used for facilities expansion, upgrades, new market penetration, working capital, etc. By providing the investment products described above, Gazelle Finance is serving as a partner sharing the risk and returns of your business. 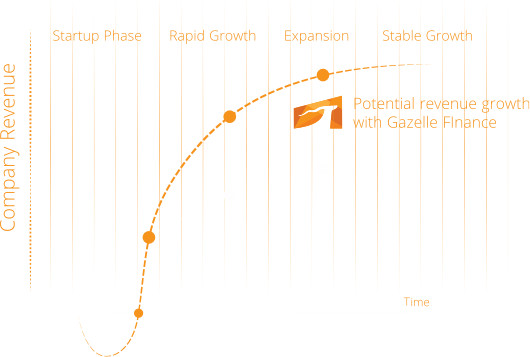 As this kind of partner, Gazelle Finance also provides active and ongoing strategic engagement, focused on enhancing your ability to drive revenue growth and profitability. Through a separate, special subsidized facility, Gazelle Finance may also be able to provide your company with special zero-interest loans that can be used to hire 3rd party experts to enhance your company's capacity in areas such as marketing, production, and financial management.